Mars Hand Lens Imager (MAHLI) is placed on Curiosity’s arm and took this picture of a test drilling site in a target area called “Mojave”. (Aptly named as it does look a bit like the Mojave desert in south-western United States.) 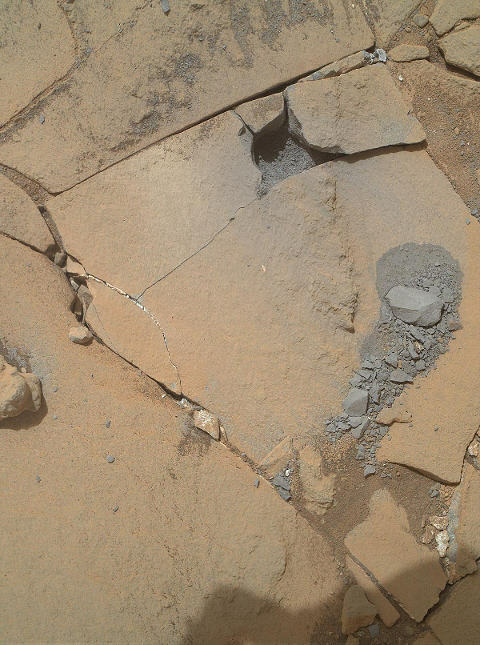 We can see that the drill bored through and even cracked, parts of the orange-brown rock like top surface. The small, shallow hole revealed a grey coloured surface where a cement like substance was found underneath. Scientists from NASA would have used this result to evaluate the drill results and assess whether additional drilling and sample testing be conducted at this location. 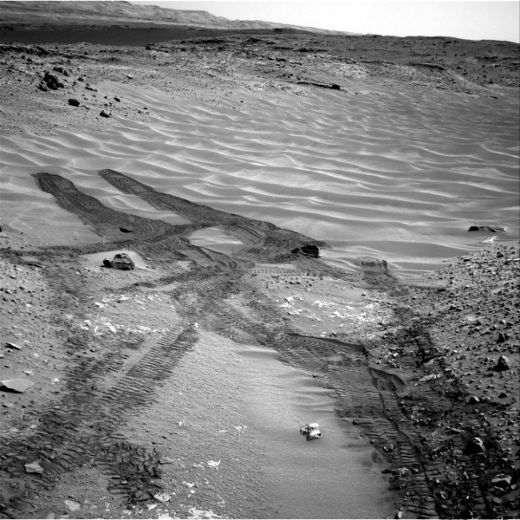 These tracks on a familiar looking sandy surface aren’t from one of the many barren deserts on Earth but instead come to us from NASA’s Curiosity rover on Mars. The rover was looking down down a ramp it had previously come up, at the northeastern end of “Hidden Valley” on Mars. In the distance we can also see the slopes of Mount Sharp within the Gale Crater. The rover’s Navcam was used to photograph this south facing view on its 717th day on Mars. This highly detailed image was taken by Curiosity rover’s Mars Hand Lens Imager (MAHLI) on September 8, 2012. On that day, which happened to be Curiosity’s 33rd day on Mars, its MAHLI dust cover was finally retracted and picture of the surface was taken. 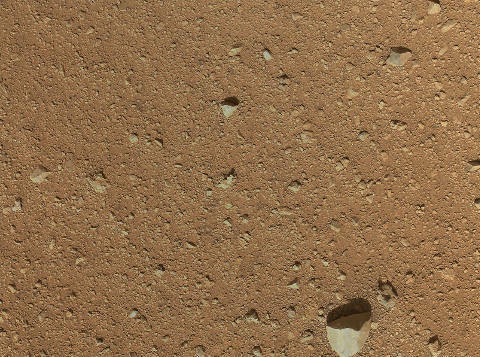 This patch of dusty Maritan ground is only about 34 inches across and the one large pebble, near the bottom of the image, is about 3 inches in size. That area seems more pebbly than dusty leaving scientists to ponder the composition of the Martian surface, its wind patterns, etc. NASA’s curiosity rover recently reached a spot on Mars referred to as “the Kimberley” to continue its study of the multiple rock formations in that area. But what caught the eye of many space observers/enthusiasts also brought in special interest from UFO and alien followers – a strange light. 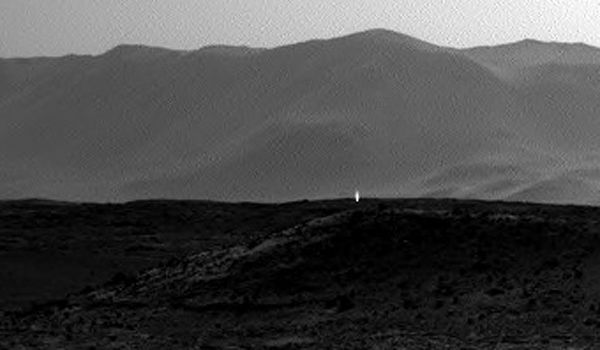 What was that strange (white) light captured by one of Curiosity’s dual NAVCAM cameras? An artificial light from a UFO or alien beings that inhabit Mars? Or is it more likely that this light was the camera capturing cosmic rays or sunlight reflecting off the rocks in that area; a malfunction with the camera; or some other artifact? You can bet that there are plenty of theories and analysis trying to establish both these trains of thought. For now, its time to go back to review all the older Mars pictures and wait for the next set of pictures beamed by Curiosity from Mars. The Mars Curiosity Rover was not be left behind the times. 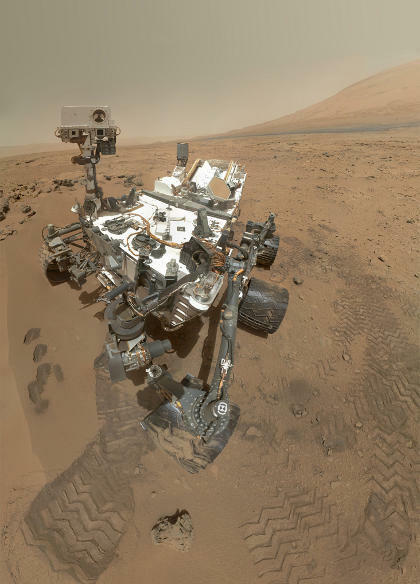 With the help of its Mars Hand Lens Imager (MAHLI), a series of images were stitched together to put together this 2012 selfie of the Mars Curiosity Rover. In this picture, the rover is situated in the Gale Crater’s “Rocknest” area with Mount Sharp visible towards the right of the picture.